Topics: Exterior Painting, House Construction, Remodeling, Tile Installation, and Bulldog Buggy Bath. Its 2 nameservers are ns4.readysetconnect.com, and ns3.readysetconnect.com. 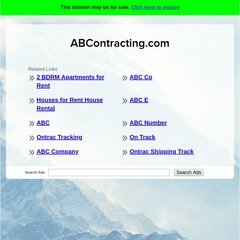 Abcontracting.com's IP address is 74.86.91.240. Softlayer Technologies Inc (Texas, Dallas) is the location of the Apache server. PING (74.86.91.240) 56(84) bytes of data.